Please complete the form below and your enquiry will be sent directly to Swellendam Ramblers via email. 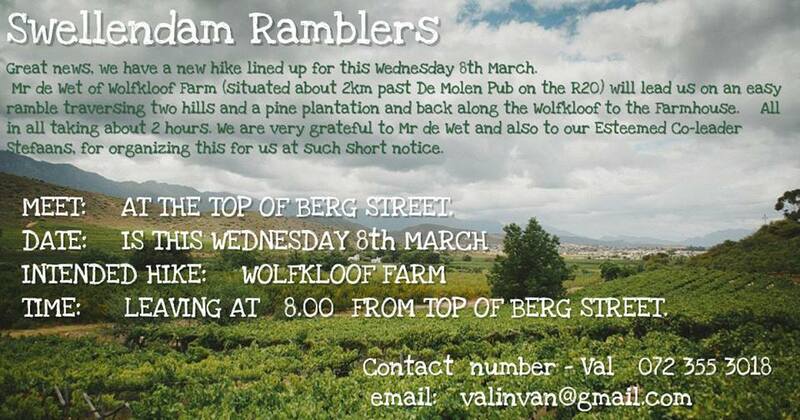 Your enquiry has been sent to Swellendam Ramblers. Great news, we have a new hike lined up for this Wednesday 8th March. Mr de Wet of Wolfkloof Farm will lead us on an easy ramble traversing two hills and a pine plantation and back along the Wolfkloof to the Farmhouse. All in all taking about 2 hours.